Triathlon is generally an individual sport…however…for me and a lot of full time parents and employees, it is very much a team effort to make everything work. Without the support of my amazing wife, I would be worthless. Whether she is watching the kids, lugging kids and snacks while navigating confusing race courses, suffering through another conversation about training, or plugging her nose from the stench of sweat, she is a saint and pushes me to reach the goals I have set for myself. 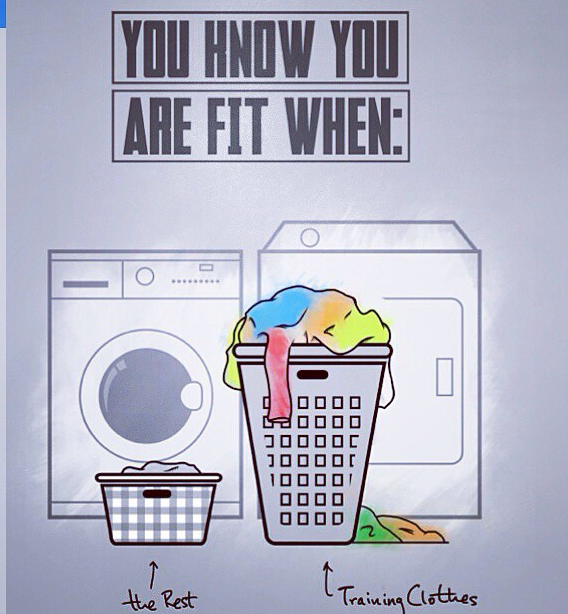 I saw this picture today and it immediately reminded me of the daily comments about how much dirty clothes I produce on a weekly basis. Yes my wife is amazing and supportive…that doesn’t mean she loves all the unfortunate side effects of being married to a triathlete. and for me, triathlon is a team effort. I would never make it to the finish line without my wife. She is my biggest fan and I could never express my gratitude enough. No she does not run or participate in triathlon. She participates in the sport of spectating and could with a first place medal!